In current version, ZW3D didn't support well in 4K screen. 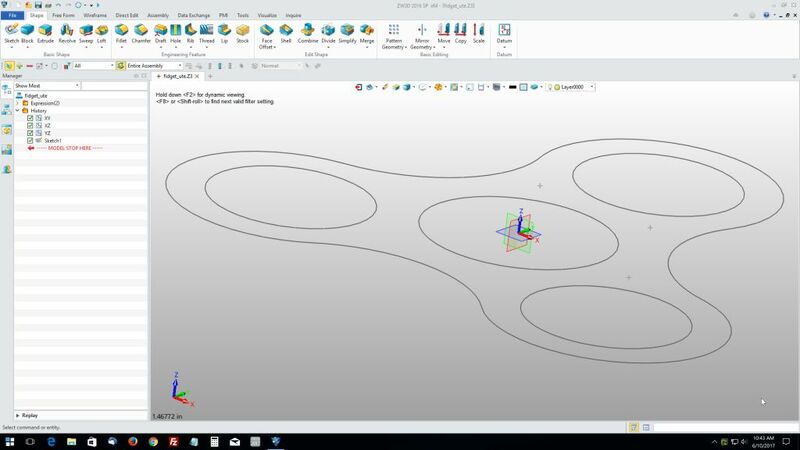 Below is one of the method to workaround. As always, make sure youbackup your registry and tread lightly in this area. We are just going to addone line. This is VERY simple. 1.Press Windows Button + R,type “regedit”, and then click OK.
4.Type PreferExternalManifest,and then press ENTER. 5.Right-click PreferExternalManifest,and then click Modify. 6.Enter Value Data 1 and select Decimal. 8. Unzip the rar file below and put the file under ZW3D install folder, then start ZW3D to verify. What does this do to the size of the icons? Do they end up being too small to read? It shows the acceptable size of the icons, if you are using 4K monitor, you might find that icons in 4K similar to the size in 1080P resolution. Just in case anyone was wondering, it's no longer necessary to do the manifest file. 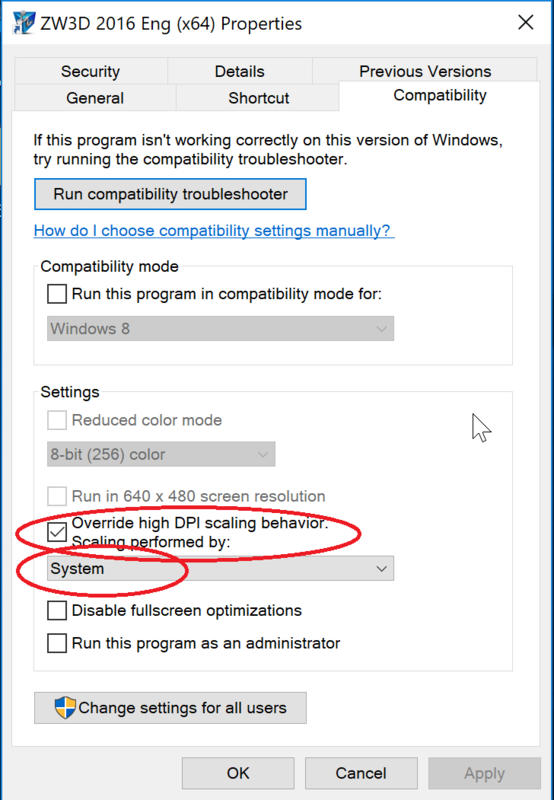 In windows 10 creator you can right click the ZW3D icon, and in properties, compatibility, check the "override high DPI scaling behavior. Scaling performed by: System. The effect is the same as using a manifest file. For me the 4K GUI is too small even with the hi DPI scaling active. My guess is that the GUI is about 1/2 the size iwould like. Secondly the I cannot get enough speed out of my trackball to get the cursor across the screen Obviously this ia mouse supplier driver issue - nothing ot with ZW. It is just a problem I face. this is how my screen looks... It's as if I was using a FHD (1920x1080) display. Did you ever figure out the 4K display with ZW3D thing? I have just seen this and tried the switch. It seems the change might actually be working. It looks different especially text. I reset the display to 4K and RMB on the 2018 Icon to set Compatability settings. The initial outcome was not great- Z3 had some small icons and some average. Today I did an experiment and changed how the scaling was controlled. Default is the Application controls e.g. ZW3D. So I changed it to System(Enhanced) and now all is happiness filled. The Z3 graphics are a delight on this setting and the ICONS are all good. Thanks Mike for the prompting. Further update on this 4K challenge. One of the problem after setting ot 4k was not being able ot see Text panles etc very well at all. 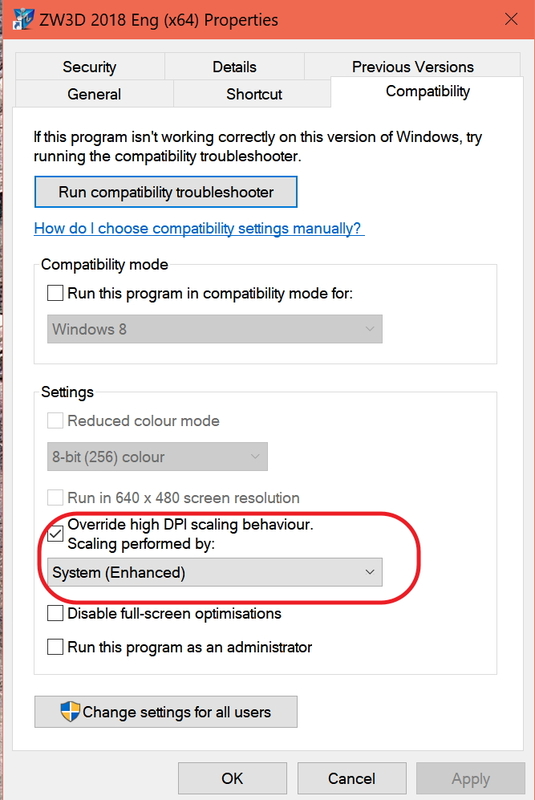 The problem seems to be connected to Having the Transparency setting ON in Windows Display Settings. Tuning this OFF worked wonders and whilst I do not seem to be able to change the Cursor size, everything else seems OK so far. Has 2019 be optimised in any way for 4K screen? I too am curious if any progress has been made, optimizing for 4K??? Running Quadro cards: It is important to use the latest drivers from nVidia. It seems that they also get things wrong sometimes and can have nasty bugs. Some big bugs have been fixed in the latest release vivavideomaker.